Aleksandr I Pavlovich (Russian: Александр I Павлович) (December 23, 1777 – December 1, 1825) was emperor of Russia from March 23, 1801 – December 1, 1825 and king of Poland from 1815–1825, as well as the first Grand Duke of Finland. He was born in Saint Petersburg to Grand Duke Paul Petrovich, later Emperor Paul I, and Sophie Marie Dorothea of Württemberg (Maria Fedorovna), daughter of Friedrich II Eugen, the Duke of Württemberg. Alexander succeeded to the throne after his father was murdered, and ruled Russia during the chaotic period of the Napoleonic Wars. In the first half of his rule Alexander tried to introduce liberal reforms. He was influenced by the French philosophes as well as the events in France. Alexander was originally enamored of Napoleon Bonaparte, but came to believe that Napoleon betrayed him. In the second half he turned to a much more arbitrary manner of conduct, which led to the abolishing of many early reforms. In foreign policy Alexander gained a certain success, winning several campaigns. Under his rule, Russia acquired Finland and part of Poland. The strange contradictions of his character make Alexander one of the most interesting tsars. Soon after his birth on December 23, 1777, Alexander was taken from his father, Paul I of Russia, by his grandmother, Catherine the Great, who utterly disliked Paul and did not want him to have any influence on the future emperor. Some sources allege that she created the plan to remove Paul from succession altogether. Both sides tried to use Alexander for their own purposes and he was torn emotionally between his grandmother and his father, the heir to the throne. This taught Alexander very early on how to manipulate those who loved him, and he became a natural chameleon, changing his views and personality depending on whom he was with at the time. Reared in the free-thinking atmosphere of the court of Catherine, he had imbibed the principles of Jean-Jacques Rousseau's gospel of humanity from his Swiss tutor, Frederic Caesar de Laharpe, and the traditions of Russian autocracy from his military governor, Nikolay Saltykov. Young Alexander sympathized with French and Polish revolutionaries, however, his father seemed to have taught him to combine a theoretical love of mankind with a practical contempt for men. These contradictory tendencies remained with him through life and are observed in his dualism in domestic and military policy. In 1793, when Alexander was 16 years old, he married the 14-year-old Louise of Baden. Meanwhile the death of Catherine in November 1796 brought his father, Paul I, to the throne. Paul's attempts at reform were met with hostility and many of his closest advisers as well as Alexander were against his proposed changes. Paul I was murdered in March 1801. Alexander succeeded to the throne on March 23, 1801, and was crowned in the Kremlin on September 15 of that year. Historians still debate about Alexander’s role in this murder. The most common opinion is that he was in favor of taking the throne but insisted that his father would not be killed. At first, indeed, this exercised little influence on the Emperor's life. The young tsar was determined to reform the outdated, centralized systems of government upon which Russia relied. While retaining for a time the old ministers who had served and overthrown the Emperor Paul, one of the first acts of his reign was to appoint the Private Committee, ironically called the "Committee of Public Safety," comprising young and enthusiastic friends of his own—Victor Palvovich Kochubey, Nikolay Nikolayevich Novosiltsev, Pavel Alexandrovich Stroganov and Adam Jerzy Czartoryski—to draw up a scheme of internal reform, which was supposed to result in an establishing of constitutional monarchy. Alexander intended to draw a constitution and grant political liberties in accordance with teachings of the Age of Enlightenment. Also, Alexander wanted to resolve another crucial issue in Russia—the future of the serfs. The regime looked into the possibilities of emancipating the serfs, although this was not to be achieved until 1861 in the regime of his grandson, Alexander II of Russia. In the very beginning of Alexander's rule several notable steps were made, including establishing freedom for publishing houses, the winding down of activities in the intelligence services and prohibition of torture. Several years later, the liberal Mikhail Speransky became one of the tsar's closest advisors, and drew up many plans for elaborate reforms. Their aims, inspired by their admiration for English institutions, far outstripped the possibilities of the time, and even after they had been raised to regular ministerial positions little of their program could come to pass. Imperial Russia was not ready for a more liberal society; and Alexander, the disciple of the progressive teacher Laharpe, was—as he himself said—but "a happy accident" on the throne of the tsars. He spoke, indeed, bitterly of "the state of barbarism in which the country had been left by the traffic in men..."
The codification of the laws initiated in 1801 was never carried out during his reign; nothing was done to improve the intolerable status of the Russian peasantry; the constitution drawn up by Mikhail Speransky, and passed by the emperor, remained unsigned. 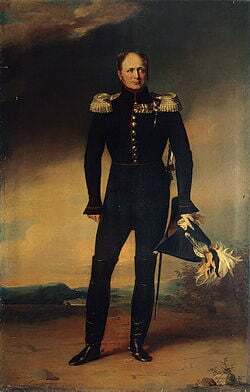 Finally elaborate intrigues against Speransky initiated by his political rivals led to the loss of support of Alexander and subsequent removal in March 1812. Alexander, without being consciously tyrannical, possessed in full measure the tyrant's characteristic distrust of men of ability and independent judgment, lacked also the first requisite for a reforming sovereign: confidence in his people; and it was this want that vitiated such reforms as were actually realized. He experimented in the outlying provinces of his empire; and the Russians noted with open murmurs that not content with governing through foreign instruments, he was conferring on Poland, Finland and the Baltic provinces benefits denied to themselves. In Russia, too, certain reforms were carried out, but they could not survive the suspicious interference of the autocrat and his officials. The newly created Council of Ministers and State Council under Governing Senate, endowed for the first time with certain theoretical powers, became in the end but the slavish instruments of the tsar and his favorites of the moment. The elaborate system of education, culminating in the reconstituted, or new-founded, universities of Dorpat, Vilna, Kazan and Kharkov, was strangled in the supposed interests of "order" and of Russian Orthodox Church; while the military settlements that Alexander proclaimed as a blessing to both soldiers and state were forced on the unwilling peasantry and army with pitiless cruelty. Though they were supposed to improve living conditions of soldiers, the economic effect in fact was poor and harsh military discipline caused frequent unrest. Even the Bible Society, through which the emperor in his later mood of evangelical zeal proposed to bless his people, was conducted on the same ruthless lines. The Roman archbishop and the Orthodox Metropolitans were forced to serve on its committee side by side with Protestant pastors; and village priests, trained to regard any tampering with the letter of the traditional documents of the church as mortal sin, became the unwilling instruments for the propagation of what they regarded as works of the devil. Alexander's grandiose imagination was, however, more strongly attracted by the great questions of European politics than by attempts at domestic reform that, on the whole, wounded his pride by proving to him the narrow limits of absolute power. Upon his accession, Alexander reversed the policy of his father, Paul, denouncing the League of Neutrals, making peace with the United Kingdom of Great Britain and Ireland (April 1801). At the same time he opened negotiations with Francis II of the Holy Roman Empire. Soon afterwards at Memel he entered into a close alliance with Prussia, not as he boasted from motives of policy, but in the spirit of true chivalry, out of friendship for the young King Frederick William III of Prussia and his beautiful wife Louise of Mecklenburg-Strelitz. The development of this alliance was interrupted by the short-lived peace of October 1801; and for a while it seemed as though France and Russia might come to an understanding. Carried away by the enthusiasm of Laharpe, who had returned to Russia from Paris, Alexander began openly to proclaim his admiration for French institutions and for the person of Napoleon Bonaparte. Soon, however, came a change. Laharpe, after a new visit to Paris, presented to the tsar his Reflections on the True Nature of the Consulship for Life, which, as Alexander said, tore the veil from his eyes, and revealed Bonaparte "as not a true patriot," but only as "the most famous tyrant the world has produced." His disillusionment was completed by the murder of the Louis-Antoine-Henri de Bourbon-Condé, duc d'Enghien. The Russian court went into mourning for the last of the Princes of Condé, and diplomatic relations with Paris were broken off. The events of the Napoleonic Wars that followed belong to the general history of Europe; but the Tsar's idiosyncratic attitude is telling about his mentality, though pregnant with issues momentous for the world. In opposing Napoleon I, "the oppressor of Europe and the disturber of the world's peace," Alexander in fact already believed himself to be fulfilling a divine mission. In his instructions to Novosiltsov, his special envoy in London, the Tsar elaborated the motives of his policy in the language not of diplomacy and common sense, but a more exalted idealism. The treaty which formed the Holy Alliance is a document of great interest, as in it we find formulated for the first time in an official dispatch those exalted ideals of international policy which were to play so conspicuous a part in the affairs of the world at the close of the revolutionary epoch, and issued at the end of the nineteenth century in the Rescript of Nicholas II and the conference of the Hague. The outcome of the war, Alexander argued, was not to be only the liberation of France, but the universal triumph of "the sacred rights of humanity." To attain this it would be necessary "after having attached the nations to their government by making these incapable of acting save in the greatest interests of their subjects, to fix the relations of the states amongst each other on more precise rules, and such as it is to their interest to respect." A general treaty was to become the basis of the relations of the states forming "the European Confederation." Nonetheless, he reasoned, "it was no question of realizing the dream of universal peace," although it "would attain some of its results if, at the conclusion of the general war, it were possible to establish on clear principles the prescriptions of the rights of nations." Why could not one submit to it the positive rights of nations, assure the privilege of neutrality, insert the obligation of never beginning war until all the resources which the mediation of a third party could offer have been exhausted, having by this means brought to light the respective grievances, and tried to remove them? It is on such principles as these that one could proceed to a general pacification, and give birth to a league of which the stipulations would form, so to speak, a new code of the law of nations, which, sanctioned by the greater part of the nations of Europe, would without difficulty become the immutable rule of the cabinets, while those who should try to infringe it would risk bringing upon themselves the forces of the new union. Meanwhile Napoleon, a little deterred by the Russian autocrat's youthful ideology, never gave up hope of detaching him from the coalition. He had no sooner entered Vienna in triumph than he opened negotiations with him; he resumed them after the Battle of Austerlitz (December 2, 1805). Imperial Russia and France, he urged, were "geographical allies"; there was, and could be, between them no true conflict of interests; together they might rule the world. But Alexander was still determined "to persist in the system of disinterestedness in respect of all the states of Europe which he had thus far followed," and he again allied himself with the Prussia. The campaign of Jena and the battle of Eylau followed; and Napoleon, though still intent on the Russian alliance, stirred up Poles, Turks and Persians to break the obstinacy of the tsar. A party in Russia, headed by the tsar's brother Grand Duke Constantine Pavlovich, was clamorous for peace; but Alexander, after a vain attempt to form a new coalition, summoned the Russian nation to a holy war against Napoleon as the enemy of the Orthodox faith. The outcome was the rout of Friedland (June 13/ June 14, 1807). Napoleon saw his chance and seized it. Instead of making heavy terms, he offered to the chastened autocrat his alliance, and a partnership in his glory. 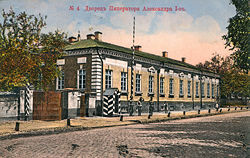 The two emperors met at Tilsit on June 25, 1807. Alexander, dazzled by Napoleon's genius and overwhelmed by his apparent generosity, was completely won. Napoleon knew well how to appeal to the exuberant imagination of his newfound friend. He would divide with Alexander the empire of the world; as a first step he would leave him in possession of the Danubian principalities and give him a free hand to deal with Finland; and, afterwards, the emperors of the Eastern Roman Empire and Western Roman Empire, when the time should be ripe, would drive the Turks from Europe and march across Asia to the conquest of India. A program so stupendous awoke in Alexander's impressionable mind an ambition to which he had hitherto been a stranger. The interests of Europe were forgotten. "What is Europe?" he exclaimed to the French ambassador. "Where is it, if it is not you and we?" The brilliance of these new visions did not, however, blind Alexander to the obligations of friendship; he refused to retain the Danubian principalities as the price for suffering a further dismemberment of Prussia. "We have made loyal war," he said, "we must make a loyal peace." It was not long before the first enthusiasm of Tilsit began to wane. Napoleon was quick to promise, slow to fulfill his promises. The French remained in Prussia, the Russians on the Danube; and each accused the other of breach of faith. Meanwhile, the personal relations between Alexander and Napoleon were of the most cordial character; and it was hoped that a fresh meeting might adjust all differences between them. The meeting took place at Erfurt in October 1808, resulting in a treaty that defined the common policy of the two emperors. But Alexander's relations with Napoleon nonetheless suffered a change. He realized that in Napoleon, sentiment never got the better of reason, that as a matter of fact he had never intended his proposed "grand enterprise" seriously, and had only used it to occupy the mind of the tsar while he consolidated his own power in Central Europe. For Alexander too, the French alliance became not a fraternal agreement to rule the world, but an affair of pure policy. He used it, in the first instance, to remove "the geographical enemy" from the gates of Saint Petersburg by wresting Finland from the Swedes (1809); and he hoped by means of it to make the Danube the southern frontier of Russia. Events rapidly led to the rupture of the Franco-Russian alliance. 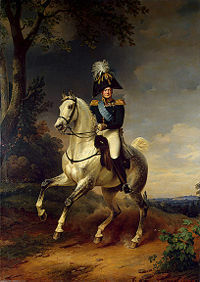 Alexander did assist Napoleon in the war of 1809, but he declared plainly that he would not allow the Austrian Empire to be crushed out of existence; and Napoleon complained bitterly of the inactivity of the Russian troops during the campaign. The tsar, in turn, protested against Napoleon's encouragement of the Poles. In the matter of the French alliance he knew himself to be practically isolated in Russia, and he declared that he could not sacrifice the interest of his people and empire to his affection for Napoleon. "I don't want anything for myself," he said to the French ambassador, "therefore the world is not large enough to come to an understanding on the affairs of Poland, if it is a question of its restoration." The Treaty of Vienna, which added largely to the Duchy of Warsaw, he complained had "ill requited him for his loyalty," and he was only mollified for a short time by Napoleon's public declaration that he had no intention of restoring Poland—and by a convention, signed on January 4, 1810, but not ratified—abolishing the Polish name and orders of chivalry. But if Alexander suspected Napoleon, Napoleon was no less suspicious of Alexander; and, partly to test his sincerity, he sent an almost peremptory request for the hand of the Grand Duchess Anne, the younger sister of the tsar. After some little delay Alexander returned a polite refusal, on the plea of the tender age of the princess and the objection of the empress’ dowager, Maria Fyodorovna, to the marriage. Napoleon's answer was to refuse to ratify the convention of January 4, 1810, and to announce his engagement to the Archduchess Marie Louise of Austria in such a way as to lead Alexander to suppose that the two marriage treaties had been negotiated simultaneously. From this time the relation between the two emperors gradually became more and more strained. The annexation of Oldenburg to France in December 1810, the principality of the tsar's uncle, Peter Friedrich Wilhelm, Duke of Oldenburg (January 3, 1754–July 2, 1823), added another to the personal grievances of Alexander against Napoleon; while the ruinous reaction to the policy of "the continental system" on Russian trade made it impossible for the tsar to maintain the policy, Napoleon's chief motive for the alliance. An acid correspondence followed, and ill-concealed armaments culminated in Napoleon's invasion of Russia in the summer of 1812. Yet, even after the French had passed the frontier, Alexander still protested that his personal sentiments towards the Emperor were unaltered; "but," he added, "God Himself cannot undo the past." It was the occupation of Moscow and the desecration of the Kremlin, the sacred center of Russia, which changed Alexander’s sentiment for Napoleon into passionate hatred. In vain, the French emperor, within eight days of his entry into Moscow, wrote a letter to the tsar which was one long cry of distress, revealing the desperate straits of the Grand Army, appealing to "any remnant of his former sentiments." Alexander returned no answer to these "fanfaronnades." "No more peace with Napoleon!" he cried, "He or I, I or He: we cannot longer reign together!" The campaign of 1812 was the turning point of Alexander's life; and its horrors, for which his sensitive nature felt much of the responsibility. When Napoleon crossed the Russian border with his Grand Army, Alexander I was quite unprepared for the war, trusting the Francophile chancellor Nikolay Rumyantsev more than his French ambassador Alexander Kurakin, who had warned him about Napoleon's bellicose plans. Russia proclaimed a Patriotic War in defense of the Motherland. At the burning of Moscow, he declared afterwards, his own soul had found illumination, and he had realized once and for all the divine revelation to him of his mission as the peacemaker of Europe. He tried to calm the unrest of his conscience by correspondence with the leaders of the evangelical revival on the continent, and sought for omens and supernatural guidance in texts and passages of scripture. It was not, however, according to his own account, until the autumn of 1813 in Basel when he met the Baroness de Krüdener—a religious adventuress who made the conversion of princes her special mission—that his soul found peace. From this time a mystic pietism became the avowed force of his political, as well as his private actions. Madame de Krüdener, and her colleague, the evangelist Empaytaz, became the confidants of the emperor's most secret thoughts; and during the campaign that ended in the occupation of Paris the imperial prayer-meetings were the oracle on whose revelations hung the fate of the world. From the end of the year 1818 Alexander's views began to change. A revolutionary conspiracy among the officers of the guard, and a foolish plot to kidnap him on his way to the Congress of Aix-la-Chapelle are said to have shaken the foundations of his liberalism. At Aix he came for the first time into intimate contact with Baron von Metternich. The ascendancy of Metternich over the mind of the Russian emperor and in the councils of Europe dates from this time. It was, however, not a sudden conversion. Though alarmed by the revolutionary agitation in Germany, which culminated in the murder of his agent, the dramatist August von Kotzebue (March 23, 1819), Alexander approved of Castlereagh's protest against Metternich's policy of "the governments contracting an alliance against the peoples," as formulated in the Carlsbad Decrees of July 1819, and deprecated any intervention of Europe to support "a league of which the sole object is the absurd pretensions of absolute power." He still declared his belief in "free institutions, though not in such as age forced from feebleness, nor contracts ordered by popular leaders from their sovereigns, nor constitutions granted in difficult circumstances to tide over a crisis. "Liberty," he maintained, "should be confined within just limits. And the limits of liberty are the principles of order." It was the apparent triumph of the principles of disorder in the revolutions of Naples and Piedmont, combined with increasingly disquieting symptoms of discontent in France, Germany, and among his own people, that completed Alexander's conversion. In the seclusion of the little town of Troppau, where in October 1820 the powers met in conference, Metternich found an opportunity for cementing his influence over Alexander, which had been wanting amid the turmoil and feminine intrigues of Vienna and Aix. Here, in confidence gained during friendly chats over afternoon tea, the disillusioned autocrat confessed his mistake. "You have nothing to regret," he said sadly to the exultant chancellor, "but I have!" The issue was momentous. In January Alexander had still upheld the ideal of a free confederation of the European states, symbolized by the Holy Alliance, against the policy of a dictatorship of the great powers, symbolized by the Quadruple Treaty; he had still protested against the claims of collective Europe to interfere in the internal concerns of the sovereign states. On November 19 he signed the Troppau Protocol, which consecrated the principle of intervention and wrecked the harmony of the concert. At the Congress of Laibach, Alexander first heard of the revolt of the Greeks. From this time until his death his mind was torn between his anxiety to realize his dream of a confederation of Europe and his traditional mission as leader of the Orthodox crusade against the Ottoman Empire. At first, under the careful nursing of Baron von Metternich, the former motive prevailed. He struck the name of Alexander Ypsilanti (1792-1828) from the Russian army list, and directed his foreign minister, Giovanni, Count Capo d'Istria, himself a Greek, to disavow all sympathy of Russia with his enterprise; and, next year, a deputation of the Morea Greeks on its way to the Congress of Verona was turned back by his orders on the road. He made, indeed, some effort to reconcile the principles at conflict in his mind. He offered to surrender the claim, successfully asserted when the Ottoman Sultan Mahmud II had been excluded from the Holy Alliance and the affairs of the Ottoman Empire from the deliberations of Vienna, that the affairs of the East were the "domestic concerns of Russia," and to march into the Ottoman Empire, as Austria had marched into Naples, "as the mandatory of Europe." Metternich's opposition to this—illogical, but natural from the Austrian point of view—first opened his eyes to the true character of Austria's attitude towards his ideals. Once more in Russia, far from the fascination of Metternich's personality, the immemorial spirit of his people drew him back into itself; and when, in the autumn of 1825, he took his dying Empress Louise of Baden (January 24, 1779–May 26, 1826) for change of air to the south of Russia, in order—as all Europe supposed—to place himself at the head of the great army concentrated near the Ottoman frontiers, his language was no longer that of "the peace-maker of Europe," but of the Orthodox tsar determined to take the interests of his people and of his religion "into his own hands." Before the momentous issue could be decided, however, Alexander died, "crushed," to use his own words, "beneath the terrible burden of a crown" which he had more than once declared his intention of resigning. He had been married on October 9, 1793, to the princess Louise of Baden (Elisabeth Alexeyevna), a political match which, as he regretfully confessed to his friend Frederick William III, had turned to misfortune for both; and he consoled himself in the traditional manner. The two children of the marriage both died, grandduchess Maria died on July 8, 1800, and the grandduchess Elizaveta on May 12, 1808. Their common sorrow drew husband and wife closer together. Towards the close of his life their reconciliation was completed by the wise charity of the empress in sympathizing deeply with him over the death of his beloved daughter by Princess Maria Naryshkina. Alexander became increasingly involved in mysticism and increasingly more suspicious of those around him. On the way to the conference in Aachen, Germany, an attempt to kidnap him made him more suspicious of those around him. In the autumn of 1825, due to the increasing illness of Alexander's wife, the emperor undertook a voyage to the south of Russia. During this trip, he himself caught a cold which developed into typhus, from which he died in the southern city of Taganrog on December 1, 1825. His wife died a few weeks later, as the emperor's body was transported to Saint Petersburg for the funeral. He was interred at the Saint Peter and Paul Cathedral of the Peter and Paul Fortress in Saint Petersburg on March 13, 1826. The unexpected death of the emperor far from the capital caused persistent rumors that his death and funeral were staged, while the emperor allegedly renounced the crown and retired to spend the rest of his life in solitude. It was rumored that a "soldier" was buried as Alexander, or that the grave was empty, or that a British ambassador at the Russian court said he had seen Alexander boarding a ship. Some claimed that the former emperor had become a monk in either Pochaev Lavra or Kievo-Pecherskaya Lavra or elsewhere. Many people, including some historians, supposed that a mysterious hermit Feodor Kuzmich (or Kozmich) who emerged in Siberia in 1836 and died in the vicinity of Tomsk in 1864 was in fact Alexander under an assumed identity. While there are testimonies that "Feodor Kozmich" in his earlier life might have belonged to a higher society, proof that he was the former emperor, Alexander I, was never established beyond a reasonable doubt. The immediate aftermath of Alexander's death was also marked by confusion regarding the order of succession and by the attempt of a military coup-d'etat by liberal-minded officers. The heir presumptive, Tsesarevich and Grand Duke Constantine Pavlovich had in 1822 renounced his rights of succession, but this act was not publicly announced, nor known to anybody outside of a few people within the tsar's family. For this reason, on November 27 (O.S. ), 1825 the population, including Constantine's younger brother Nicholas, swore allegiance to Constantine. After the true order of succession was disclosed to the imperial family and general public, Nicholas ordered that the allegiance to him to be sworn on December 14 (O.S. ), 1825. Seizing the opportunity, the Decembrists revolted, allegedly to defend Constantine's rights to the throne, but in reality to initiate regime change in Russia. Nicholas I brutally suppressed the rebellion and sent the ringleaders to the gallows or Siberia. Some confidants of Alexander reported that in the last years the emperor was aware that the secret societies of future Decembrists were plotting the revolt, but chose not to act against them, remarking that these officers were sharing "the delusions of his own youth." Historians believe that these secret societies appeared after the Russian officers returned from their Napoleonic campaigns in Europe in 1815. Alexander I was the godfather of future Queen Victoria of the United Kingdom. History of "Alexander I of Russia"
This page was last modified on 1 March 2019, at 16:04.